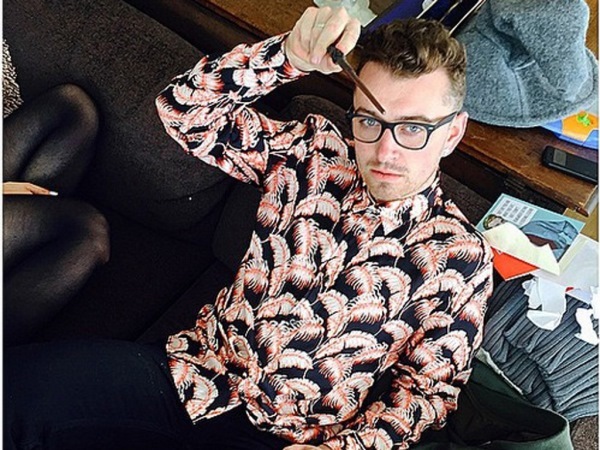 Sam Smith is over the moon with his "authentic" Harry Potter wands. The British singer turns 23 today and while he's been feeling under the weather recently due to suffering a haemorrhage on his vocal chords, a certain present cheered him up. In a photo posted on Instagram, Sam can be seen lounging back on a sofa with a pair of oversized spectacles and aiming a wand at the camera, resembling the boy wizard played by Daniel Radcliffe. "My sisters are actually the f**king BEST. They got me authentic Harry Potter wands!!!!!!!!!! Best present EVERRRRRRR (sic)" Sam wrote alongside the photo. To show how grateful he is, he also uploaded a collage of photos of himself and his sister Mabel. She returned the favour by posting the picture too, as well as a glimpse at treats she made for her brother's special day. "An attempt at making Bday cupcakes (sic)" she captioned the photo. It seems getting older has made Sam take the time to reflect upon his life. Over the past few months the star has shed a lot of weight, which has seen his confidence boost massively. However he was happy to poke fun at his former self with a humorous snap, showing his ten-year-old self as a cartoon sailor. "Turning 23 TOMORROW. Dear lord. Time goes so quickly "23 tomorrow!!!!!!! Feels like yesterday I was an obese 10 year old (sic)" he wrote. He's had to keep quiet recently after having surgery in New York on his vocal chords, but used the situation to his advantage when accepting awards, including Top New Artist, at the Billboards on Sunday. In video footage Sam was seen re-creating a scene from Love Actually, in which a character holds up a series of white boards with a message.